It's Halloween, everybuddy! In case we haven't mentioned it before, we love this day of the year. It also happens to be Mancat Monday. What fa-BOO-lous timing it is, therefore, that Evan's auntie (aka, this human mom's sister) captured some fun and festive shots of my boy Evan and a certain little buddy of his. What a BOO-tiful friendship Evan and that ghostly friend of his have. Does anybuddy else out there have any ghoulish friends? 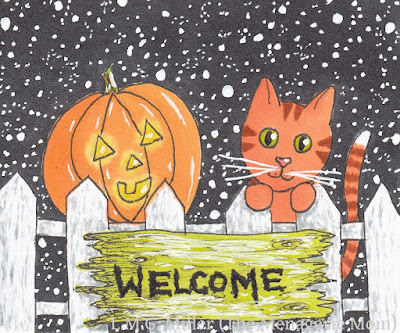 Happy Halloween to all of our furiends! 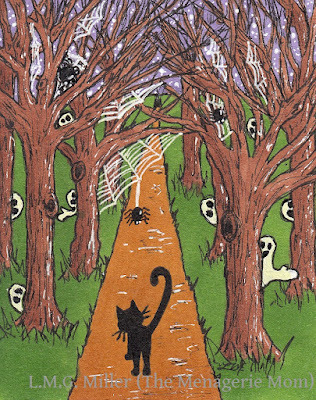 We hope your day is fa-BOO-lous (and full of plenty of treats, and maybe just a fun little trick or two)! How about a quick review of some Halloween tips? 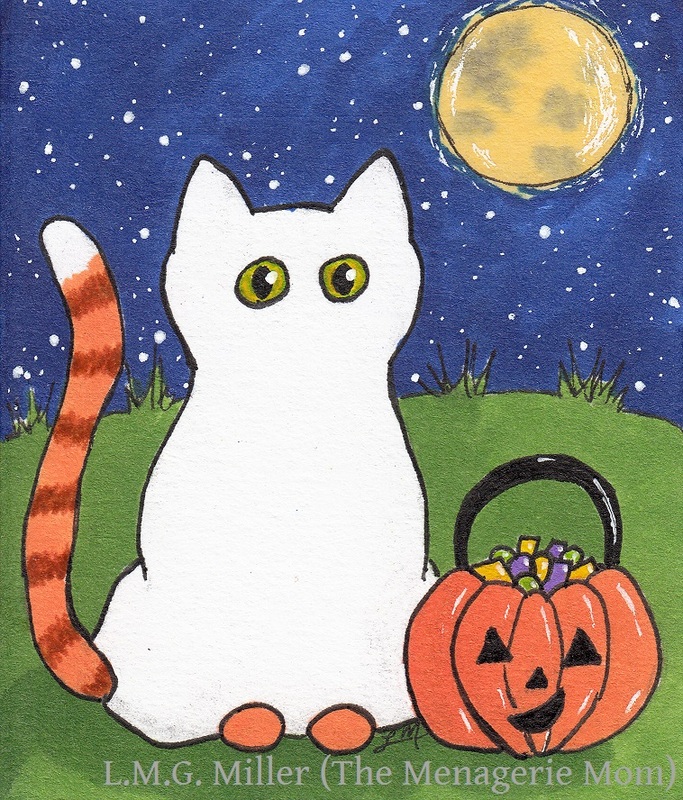 Remember, Halloween night often means pranksters may very well be out and about, so please keep your furbabies safe and sound indoors. 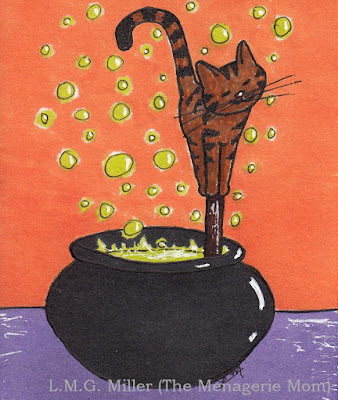 It can be especially dangerous for black cats out on Halloween night. 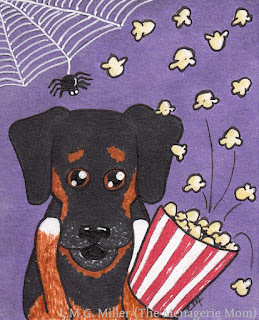 If you are handing out candy to the trick-or-treaters, please take precautions to keep your furbabies safe and away from the open door, such as by keeping them tucked away in a separate room, or at least blocked from access to the front door with something along the lines of a baby gate. Also consider the safest place for your furbaby to stay if you are throwing a Halloween party at your home. And when you have yourself some much-deserved Halloween candy, please remember that many of these sweet and sugary treats are not good for the furbaby in your life. Especially avoid giving your furbaby any candy with chocolate or that is sugar-free, especially if made with xylitol. And although being festive is fun, please don't forget to keep any potentially risky Halloween decorations out of your furbaby's reach. Have fun, but please remember safety first! My furbabies have been quite busy lately, posing for photos and Halloween drawings, begging for early Halloween treats, having all sorts of costume partiea and enjoying nip punch all through the night, all that jazz. Busy, busy, busy. That's why they asked for a day off, and I granted them that, because I'm just that pawesome of a mom. Well, that, and because I have some backup guest selfies already lined up for this Sunday Selfies blog hop, hosted by our furiends over at The Cat on My Head. Cutting to the chase, I recently found out that a couple towns over from where I live is a wildlife park. It was started by a local family just last year, and it's called the Aikman Wildlife Adventure. Obviously, I had to see the beautiful animals for myself, and so I made my way out there just last weekend. And you know what? I got my fair share of willing selfie participants from some mighty stunning creatures! Don't worry, I got a kitty selfie, too. I won't lie, this isn't even all of the selfies I gathered at the wildlife park last weekend.You wouldn't believe how photogenic and camera savvy these new furiends of mine were! That being said, I'm keeping a few of the selfies in my back pocket, you know, for a rainy day or something of the sort. But, I'm still not quite done yet. I do have two more creatures to share with you. These are of a different sort, though. You see, today's prompt for JNW's Halloween Challenge is none other than creature. I think this might have been the hardest drawing for me to work my way through. 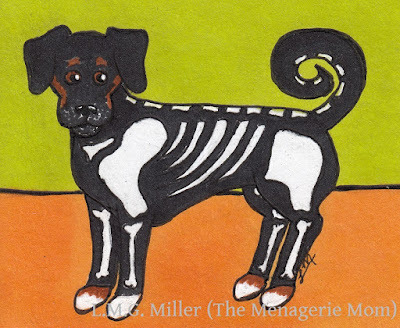 It came down to the fact that I wanted my angel Rosie to star in one of the Halloween drawings, and I wanted hers to have some sort of special meaning. I just couldn't pick which word throughout this month's prompts fit her best, though. Ultimately, for Rosie I chose this one, creature. Why? Because some of Rosie's favorite toys were in the shapes of some rather interesting creatures. One of her favorites in her older years was this red and yellow bug-like thing. I don't even know what compelled me to bring it home from the store for her one day, as, I'll be honest, it was quite ugly. Another one of her favorites was, I believe, supposed to be a cow. But, I myself have never seen a pastel pink and blue and yellow cow with three horns and a bell on its tail, so I could be wrong. Have you ever been to an animal sanctuary of some sort where they ask you to please keep your hands to yourselves, to not pet the animals? Although I know how disheartening these sort of instructions can be for animal lovers, they are in place for a reason, and most often a good one. Not only is there the factor of your physical safety, but also the fact that certain diseases can pass from animal to animal on the mere hand or even clothes of a human. There are diseases that can be transferred from animals within the same species, and those that can infect animals even of different species. This is why some shelters, whether it be one for dogs or cats or something more exotic, ask that you please not pet the animals. They do this both for the safety and health of yourself and the animals there, as well as for any animals you might be seeing later that day, even your own furbabies. So, although it might seem disheartening or even irritating to be told to keep your hands to yourselves at an animal sanctuary, please understand that it is for a good reason. A healthy animal is a happy animal, and sometimes they are best kept healthy and happy if we keep our hands to ourselves. And, this drawing segues us into our next bit of art, if you can even call it that. You see, this human here loves to carve jack-o'-lanterns for Halloween. That being said, I am far from a decent carver, and a knife in my hands is not going to result in anything all that pretty. But, with that warning out there, we thought we'd share the jack-o'-lantern that this human carved up the other night. 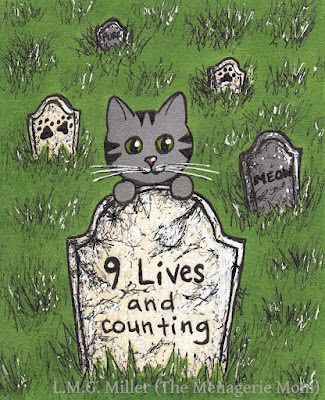 Have a spooktacular Caturday, furiends! How about another Halloween tip? Keep in mind that it's not just open doors and trick-or-treaters and their candy that could get your furbaby in trouble at Halloween time. Be cognizant of other risks, such as any knives that might make an appearance during the carving of a jack-o'-lantern, or the candle and flame that come with lighting those pumpkins up. Some furbabies like to help out with such tasks, as I'm sure you all know and have experienced. If you have yourself a helper who is a little too persistent around dangers such as knives and candles, be sure to take precautions to keep them safe. Some furbabies can successfully be distracted with toys or food, while others may need to be blocked out of the dangerous area altogether. Remember, safety first! Welcome to the (almost) weekend! 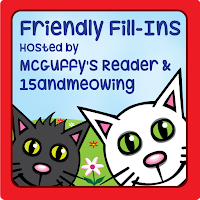 We'll start off this lovely Friday like we always do, and that's with the fun Friendly Fill-Ins challenge, hosted by our good pals over at 15andmeowing and McGuffy's Reader. We always enjoy the fill-ins their brilliant minds come up with, and this week is no different. See here? 1. The first thing I check when I go online is _________. 2. My signature dish is _________. 3. My Halloween night is usually _________. 4. Trick or treaters _________. 1. The first thing I check when I go online is my email. 2. My signature dish is chocolate pudding. 3. My Halloween night is usually followed by a sugar hangover. 4. Trick-or-treaters should always say "thank you". Now, are you ready for some Eddy? Here she is, with a little side of Evan. Eddy adores her big brother Evan. She loves to interrupt him when he's napping. Eddy thinks it's just the best thing in the world to wake big brother up, kick him a few times, maybe get a slap or two in, and then run off like greased lightning before he can defend himself. Sometimes, though, if Evan's lucky, Eddy will just be in the mood to chillax and play a little footsie. There you go, Eddy. Just don't stay up too late, young lady. Remember that cats are nocturnal by nature. While living with non-nocturnal humans may turn some cats towards a similar schedule, others tend to fall back on the nighttime activities their instincts tell them is normal. If you have a heavily nocturnal cat, and as long as medical conditions have been ruled out as a possible cause of nighttime shenanigans, there are ways of trying to curb your kitty from keeping you up at night. We've mentioned some of these methods in past tips, and they include feeding your feline before bed. Many cats will sleep best after a hardy meal, while others simply rest better knowing that their bowl is not empty. Either way, try to reserve a portion of their daily food for the evening hours. Also be sure that your kitty has interactive toys to keep him or her occupied. What's more, try leaving these toys all day. 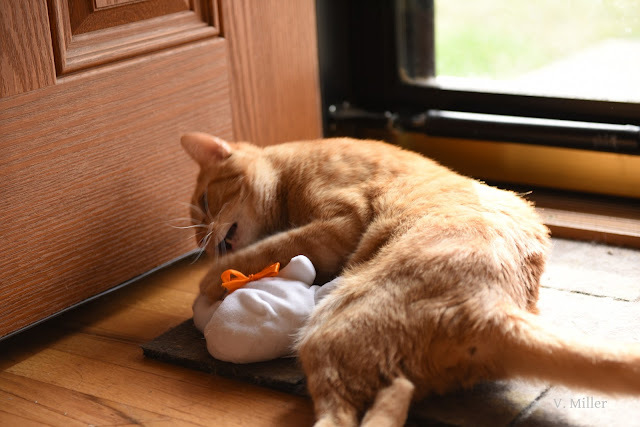 If your kitty can use up some energy on these toys during the day, then they may very well sleep better at night. 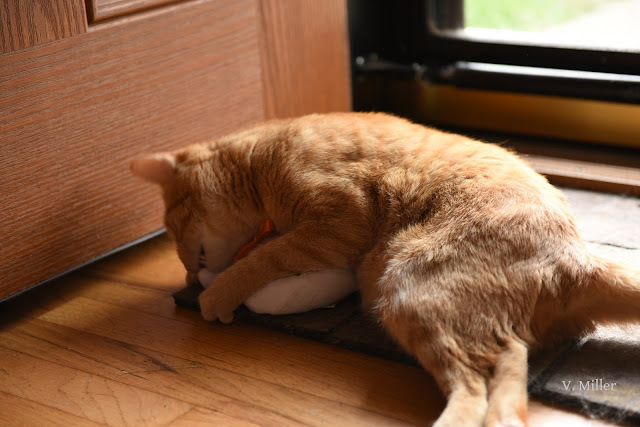 Or, some cats simply prefer to play with such toys at night, in which case you can place the toys in a location that allows kitty to play and you to sleep. And, if your kitty seems especially playful or restful at night in the autumn and winter, perhaps they are feeling cold. Cats might pace to find a warm place to sleep, or might play or seek out food to help them feel warm. In this case, please be sure that your kitty, who is a warm weather animal by nature, has somewhere warm to sleep in the cold months. On occasion, Thimble will replace her sugary sweet face with something a little more, well, ominous. My, what big eyes you have, Thimble. Ah, yes, you certainly have that furrowed brow down pat. Ouch. If looks could kill. Well done, Thimble. You have proven yourself quite the versatile model. Sweeter than sugar one second, and staring daggers the next. That's my girl! Wishing everybuddy a lovely day! Keep in mind that while Halloween may be a fun holiday, Halloween night can be a very dangerous time for your furbabies, especially outdoors. 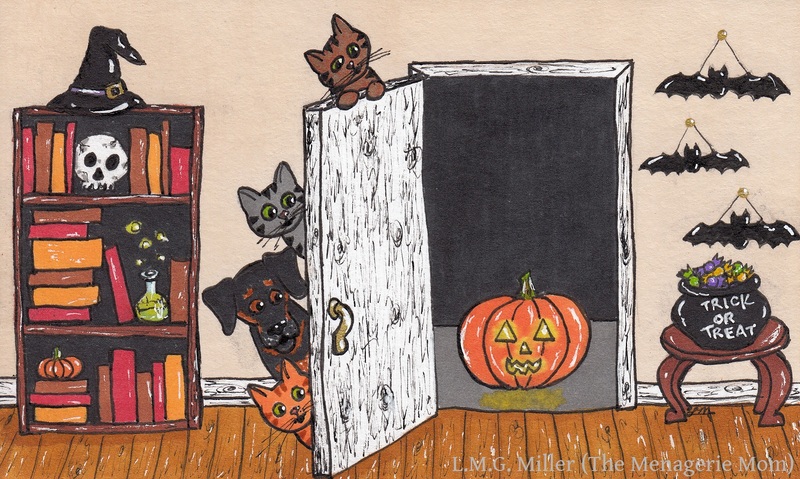 Some people think Halloween night is a fun time for pranks, so please be sure that all of your furbabies are kept indoors or somewhere safe and supervised on Halloween. Please do not let your indoor/outdoor furbabies roam that night, especially if you live in an area with a lot of traffic and trick-or-treaters. 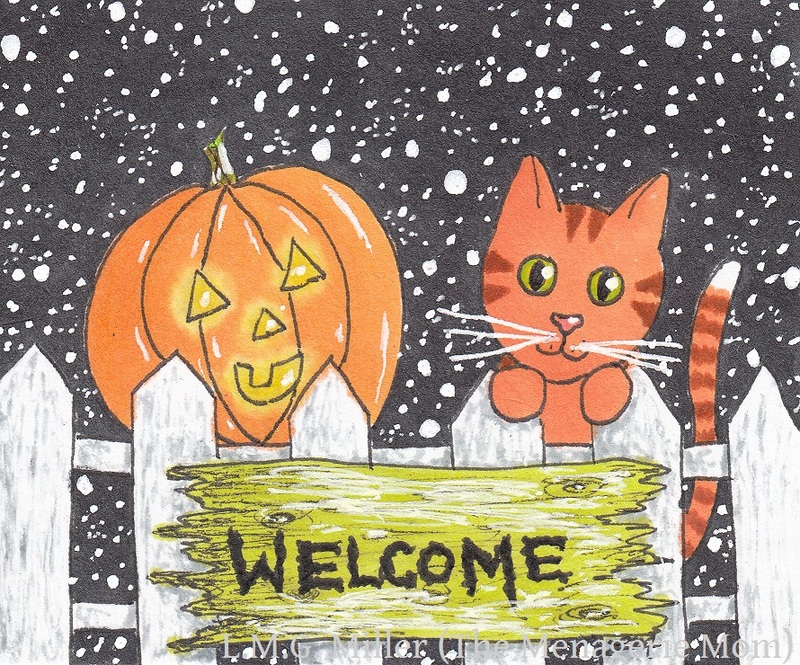 With the increased car and foot traffic on Halloween night, as well as the risk of pranksters, outdoors could very well be a place full of potential hazards for a cat or dog. 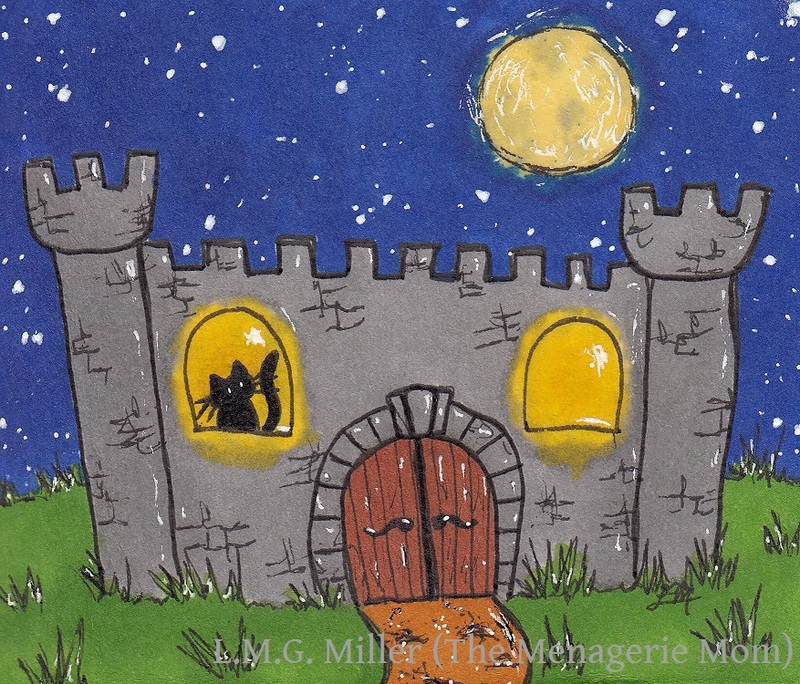 So, again, please keep all furbabies tucked safely away on Halloween night! Today's tip is a logical one that I'm sure you all know. And that is, if you have any concern at all that your furbaby might have broken or fractured a bone, consult a veterinarian immediately. If your furbaby ever has a traumatic event, such as being hit by a car, falling out of a window, or being involved in any other such trauma, it is always wise to get them to a veterinarian as soon as possible to rule out any damage. Don't forget that even accidents, such as legs and paws and tails getting caught in doors or being stepped on, could lead to potential bone damage. And don't forget that our furbabies, such as our tough kitties, are often great at hiding pain, so even no or just mild signs of injury could make a trip to the vet a wise decision. In the case of any incident, x-rays and other tests can be performed to determine if there are any broken or fractured bones, or other injuries. What's more, the faster such an injury is treated, the easier the rehabilitation will likely be. For our first Chewy.com Blogger Outreach Program product review for this month, we decided to go festive. We chose to give Weruva Pumpkin Patch Up! food supplement pouches a shot. A number of our recent daily tips have focused on pumpkin and its benefits. Need a refresher? Long story short, pumpkin is high in fiber and aids in healthy digestion and stool production. Feeding pureed pumpkin, therefore, can have great benefits for the furbabies in your life. The problem, though, is that not many of us have an endless supply of pumpkin guts on hand, and buying canned pumpkin can often result in wastage, due to the small amount of pumpkin recommended versus how quickly canned pumpkin can spoil. That's where this Weruva supplement could definitely come in handy. Pumpin Patch Up! comes in single-serve pouches, for easy administration with no wasting. Even better, you don't have to worry about any mystery ingredients these might include, as it contains simply pumpkin, with some added water for processing. There is no BPA, no gluten, no mystery about it, and that makes this momma very happy. I chose this product primarily for Astrid, as she is the resident furbaby with the most belligerent bowels. But, this supplement is not just for dogs. Weruva Pumpkin Patch Up! is safe for and beneficial to both dogs and cats. This all leads us to the real question, though. And that is, will the furbabies eat it? I won't lie, I didn't let myself get too hopeful. Astrid is a finicky eater. So far we have found not a single fruit or vegetable that she is willing to eat. Honestly, not a single one. Apples? No. Carrots? Nope. Corn? Absolutely not. Broccoli? What a joke. And as for the kitties, well, they're hardly even willing to eat deliciously stinky moist food formulated for their very own species, so they didn't instill much hope in me either. But, a human can dream, so I crossed my fingers and chose to have Astrid and her kitty siblings review Weruva Pumpkin Patch Up! anyway. So, I slapped some of this healthy goodness into a bowl. It is soft and smooth, and looks and smells perfectly like pumpkin. This supplement can be offered as a treat by itself, or can be added to a meal. To be honest, worried that she would not like it, and not wanting Astrid to be wary of her beloved moist food, I tested it out by offering it as a treat by itself. And did my pouty puppy like it? No. I wish she liked it, but, alas, we can add pumpkin to the list of fruits and veggies that Astrid simply will not eat. That list now includes, well, all of them. And the kitties? They all snubbed it and kept on snoozing. So, while my furbabies gave Weruva Pumpkin Patch Up! not a single paw up, that was honestly to be expected. I was really hoping they would give it a fighting chance, because it could be so very good for them. Finicky food snobs strike again. But, especially if you know your furbaby enjoys some good ol' pumpkin, and especially if you've ever found yourself throwing out spoiled pumpkin, give these single-serve Weruva Pumpkin Patch Up! pouches a try! We hope everybuddy has a wonderful day that is scare-free (and spider-free - eek!)! Always be cognizant of any "healthy" foods and supplements you are giving your furbabies, as it is in fact possible for them to receive too much of certain vitamins, minerals, and other nutrients that these products may contain. For example, it is possible for animals to consume too much vitamin A, vitamin D, and calcium, leading to concerns such as dehydration and damage to the bones and joints. Even excess fiber can be problematic, potentially resulting in abnormalities in digestion and defecation. If you are worried about your furbaby's nutrient intake or are considering starting them on any supplements, please consult your veterinarian. You all know the facts. Evan loves his front door. And the sun. He's proven that time and time again. What's even better, though? When the sun comes in the front door. Why? Because, well, lights! Honestly, who doesn't like a light show? Evan sure loves himself a light show. Because, well, lights are super fun to chase. Evan never lets those lights out of his sight. And, one day, Evan just knows he will catch one of those lights. One day. We hope all our furiends have a lovely, sunny day full of lights! Okay, now we wish you all a bright and shiny day! Fall means cooler temperatures, which is often why some people start to grow lax with their furbabies' monthly preventatives. Please remember, though, that giving monthly preventatives year round is often the safest route for your furbaby's sake. Even in the fall and winter, especially in locations with weather on the more unpredictable side, warmer days can occur, leading to a risk of fleas and mosquitoes and the like. Fleas can be introduced into the home on any outdoor animal or on a human, and mosquitoes can easily fly in through an open door. And these buggers can give your furbaby tapeworm, bloodborne diseases, dermatitis, heartworm, and other unpleasant ailments. So, year round preventatives are not a bad idea. What's more, giving them year round ensures that you don't forget to resume administration once spring hits, which means your furbaby is at less risk from those early bird fleas and mosquitoes. Astrid's a master of the stern gaze out the window. Evan wouldn't dare pose anywhere but in the blinding sun at his trusty front door. Thimble, well, she just loves to pose. Maybe Eddy's isn't same old same old, because she's actually sort of sitting still here. You know who else didn't do the same old same old? Toby! Housemate Toby decided that he wanted to join in on the selfies today, so that he could show off how he rocked the traveling sunglasses we recently had from Phoebe of 15andmeowing. See? This calls for a shout-out. Thanks for sharing your sunglasses with us, Phoebe! All the furbabies had a blast with them. Well, Eddy wouldn't stop long enough to pose with them, but we all still enjoyed our super fun turn with them! 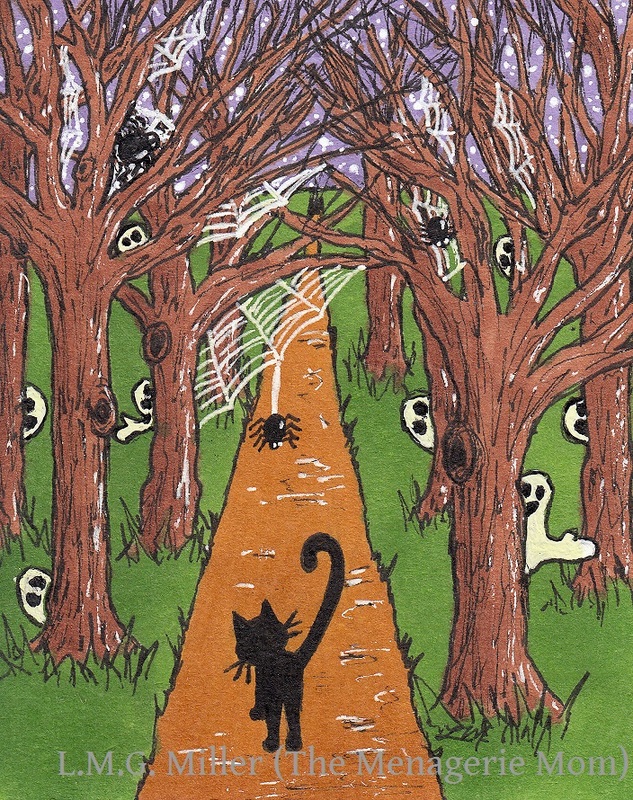 And for today's drawing, the prompt for JNW's Halloween Challenge is forest/plants. This human here loves trees and forests, so this was a fun one to ponder. We aimed for a haunted forest. We don't know how well that turned out, though, but here it is nonetheless. Especially when around unknown animals or at a location where other animals frequent, please always keep in mind that diseases can spread from animal to animal in a variety of ways. Saliva, urine, blood, and feces are some of the primary means of disease transferal. Respiratory infections are commonly spread through saliva, for example, whereas feline leukemia can be spread through saliva as well as urine and blood. There is also the concern of parasites such as Giardia, spread through feces or sources such as infested water. For these such reasons, please try to keep your furbaby from coming in contact with secretions or even such locations as the drinking sources of unknown animals. 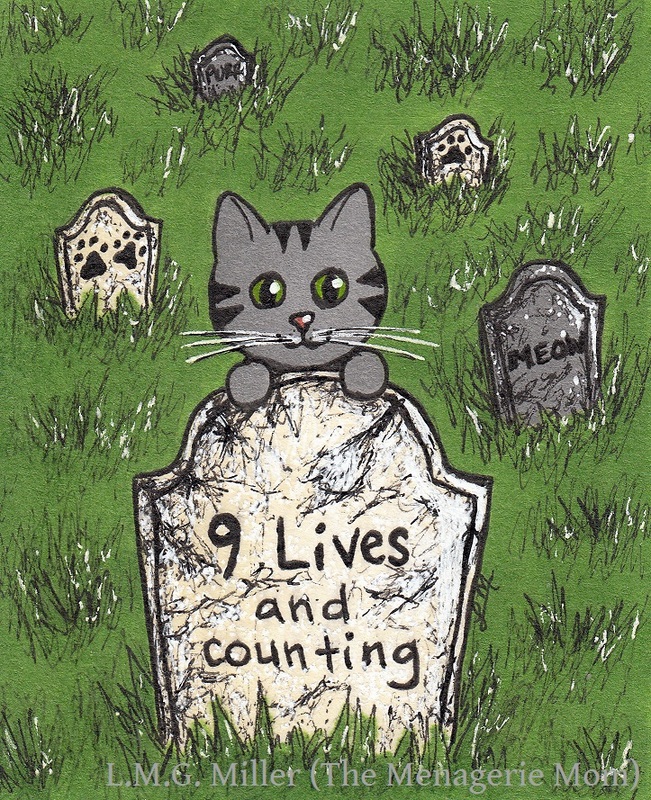 Today, our contribution for Athena's always anticipated Caturday Art blog hop was extra of fun for this here human to create. Why? Because it stems from a tradition that goes way back to when she was a kid. For as long as I can remember, my family has had a life-size scarecrow that we put up on stakes in the front yard for Halloween. When I moved out to my new house, my parents let me take it with me. 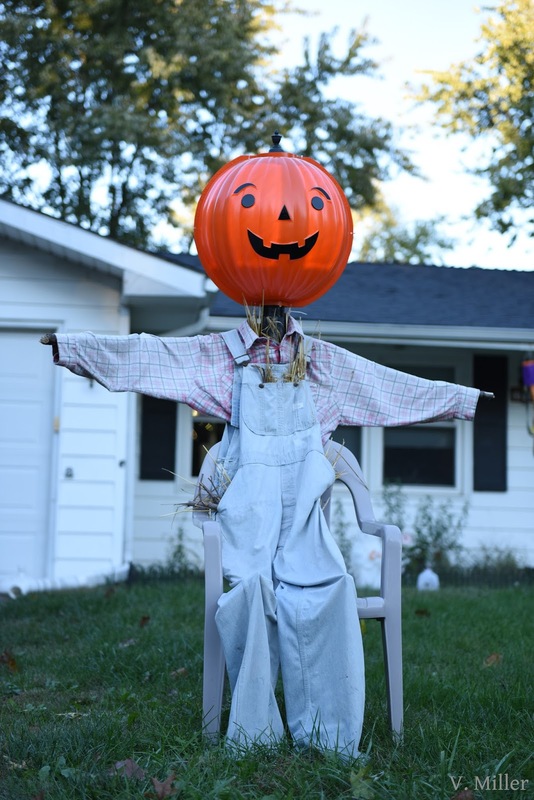 He's not a pre-assembled scarecrow, but instead has to be built each year, and I love it. He's been wearing the same pair of overalls and plaid shirt for roughly an eternity. They must have made clothes a lot hardier back in the day, because aside from some serious fading, they're still doing pretty darn good. When I was a kid, we'd make the scarecrow's face out of fabric and the like. Then, a few years back, we got one of those giant light-up pumpkin heads for our lamppost. 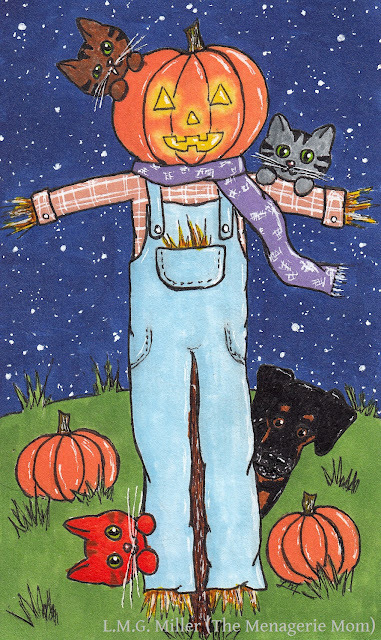 That's when we started building the scarecrow around the lamppost itself, with the glowing pumpkin as its head. This probably all seems pretty insignificant to most people. I mean, honestly, it's just a decoration. But, I won't even lie, I've always had a fondness for this scarecrow. He is one of my absolute favorite decorations to put up each year. Do you see where I'm going with this? Well, today's prompt for JNW's Halloween Challenge is decorations. As soon as I read this prompt, I knew exactly what I wanted to draw. Want to see the real deal? Well, you're in luck (thanks to my photographer of a sister, that is). Mr. Pumpkin Head is too tall for the lamppost, so he's been retired to a chair. He doesn't seem to mind. 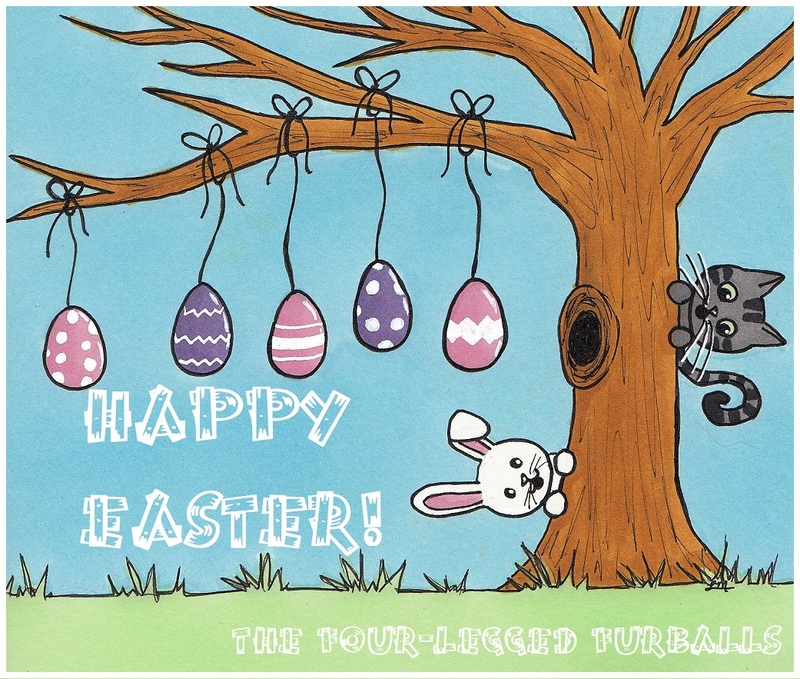 Have a fun and fantastic Caturday, everybuddy! 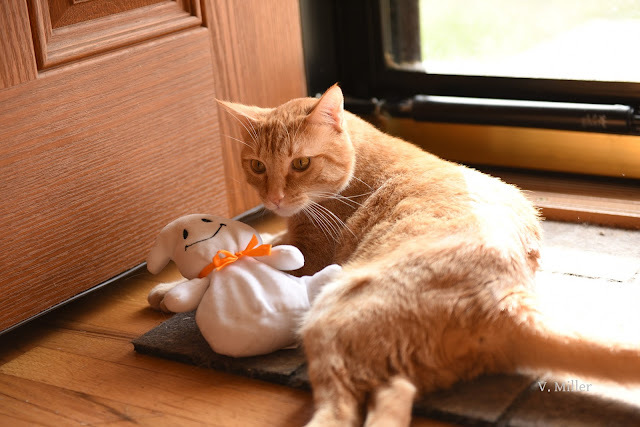 We've talked before about the benefits of pumpkin for dogs and cats. Did you know, though, that even the seeds of a pumpkin can serve as a beneficial treat for your furbaby? The seeds contain all sorts of nutrients, such as antioxidants, vitamins, minerals, and essential fatty acids and oils. They offer a plethora of health benefits that include fighting off cancer and keeping the skin and coat happy and healthy. What's more, pumpkin seeds contain cucurbitin, an amino acid that can potentially serve as a natural de-wormer. For this benefit, some people will crush up pumpkin seeds into a powder, which can be sprinkled onto food, and of which roughly 1 teaspoon three times a day is often the recommended amount. Otherwise, pumpkin seeds can be given raw, or, for more palatability, can be lightly coated with cooking oil and roasted in the oven for a few minutes. Your furbaby may very well find this a delectable treat! But please don't overdue it, as not only do you want to avoid weight gain, but it's also important that your furbaby not receive an overabundance of some of the nutrients that pumpkins and their seeds have to offer. Who's happy it's Friday? We sure are! 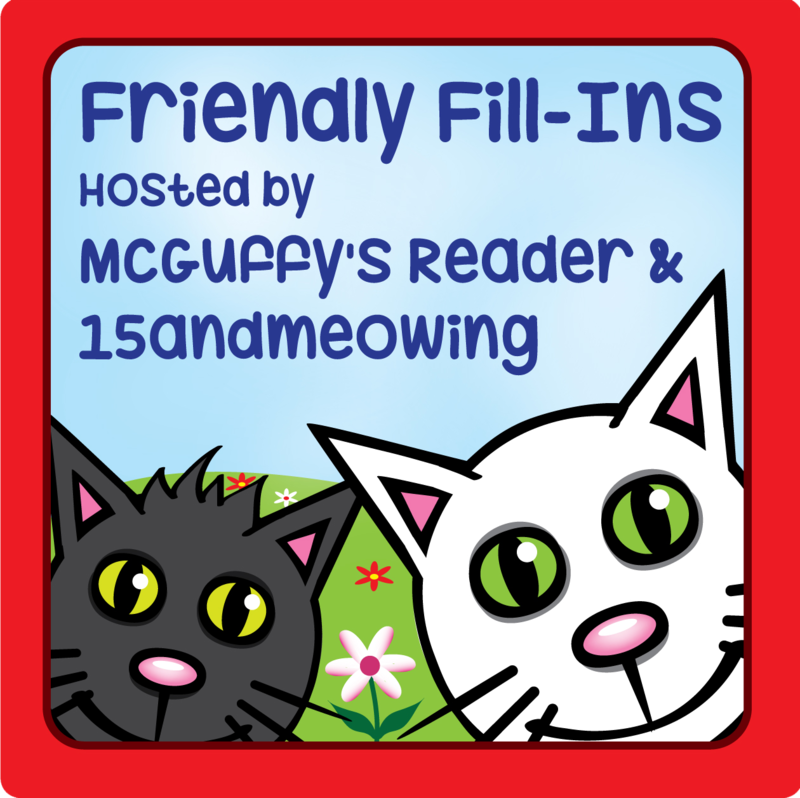 One reason for this is that it's time for the Friendly Fill-Ins challenge, hosted by our pals over at 15andmeowing and McGuffy's Reader. 1. One Halloween, I dressed as _________. 2. My favorite comedian is _________. 3. My scariest Halloween was _________. 4. _________ is my favorite Halloween treat. 1. One Halloween, I dressed as a black cat! 2. My favorite comedian is Bob Newhart. 3. My scariest Halloween was when I was about 5 years old and walked into the living room when my dad was watching the movie Halloween. 4. Banana Laffy Taffys are my favorite Halloween treat. Next up? Eddy! Did this active girl feel like posing for the camera. Of course not! How about a little stink eye? Except we're not quite done yet. Today's prompt for JNW's Halloween Challenge is cauldron. Ever since I was a kid, I've been fascinated with cauldrons (I even have flower pots that are, you guessed it, cauldrons). Honestly, what's more magical and fanciful and Halloweenish than a witch's cauldron? 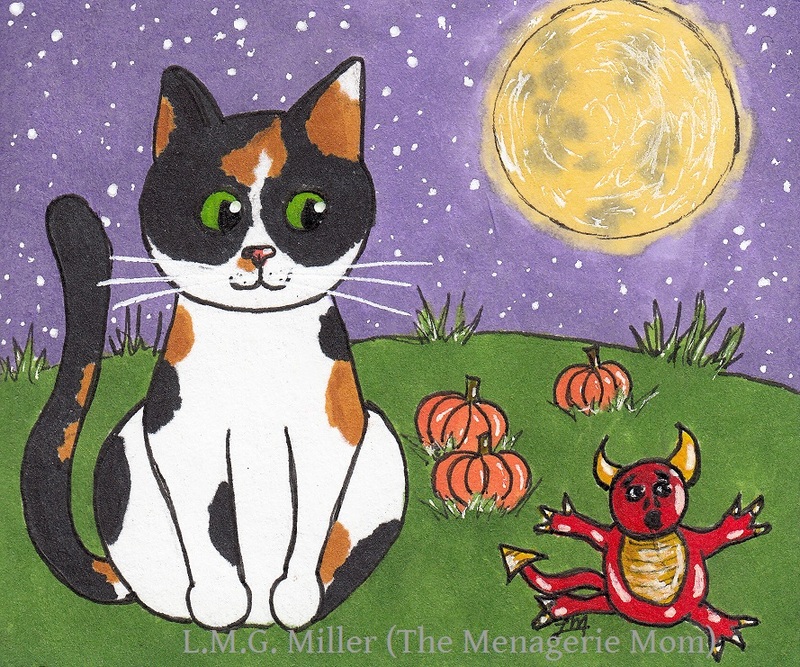 Anyway, Eddy didn't let me forget that it was her turn to star in a Halloween drawing. Well, Eddy, you sure do like stirring the pot around here, my active little lady, so this one's for you. 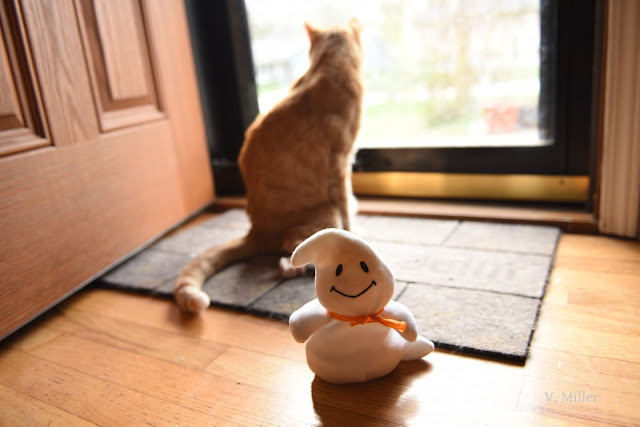 Have a spooktacular day, everybuddy! We all know that feeding our furbabies chocolate is not good for them, nor is feeding them many other sugary goods. Also beware, though, of certain products labeled as sugar-free. I'm sure many of you have heard of xylitol, a natural sweetener often used in sweets to make them safe for those with diabetes or for those simply trying to cut back on refined sugars. Xylitol, though, is toxic to our furbabies. It can cause vomiting, diarrhea, lack of coordination, and potentially seizures in dogs and cats. It can cause a sudden release of insulin in your furbaby's system, leading to hypoglycemia, and can ultimately result in liver failure. This is why any goods labeled as sugar-free should be a no-go for your furbabies, most especially when xylitol is listed as an ingredient. Also keep in mind that not only is xylitol found in sugar-free candies and gums, but also potentially other foods, such as some brands of peanut butter. Xylitol is also found in some toothpastes, mouthwashes, and potentially a number of other goods. The moral of the story is to always look at the label, and stick to foods and treats that are known to be healthy choices for your furbaby. If you know or even think your furbaby consumed anything containing xylitol, please consult a veterinarian immediately.